A very well laid out park. Nice, but neighbors are a bit close. Easy access (paved roads and parking pads), very limited cell service. Gigantic beach... very good for long walks... no off-leash area for dogs, even on the beach :o( Also, couldn't tie my doggy zip-line to any trees... argh... We camped at Grayland Beach State Park in a Travel Trailer. Westport, just a few miles away has great seafood!!! Bought an excellent side of salmon at Merino's to take with us, and had great fish and chips and beer at Bennett's Fish Shack. A very nice park!!! We chose this park because it is equidistant from both sides of the St. Helens Park. Unfortunately, the Windy Ridge road had not opened when we were there. This park is on a lake (reservoir) that is beautiful and provides opportunities for boating, swimming, and fishing. The site was level and had excellent separation from other sites. Generally very quiet while we were there. We camped at Ike Kinswa State Park in a Travel Trailer. This is a nice park. Our site (22) was very level and spacious with huge cedar trees and lots of shade. A beach with a lovely view and nice sunsets... but VERY rocky... not very good for a beach walk. Lots of kids when we were there, riding bikes around the RV loops...but still generally peaceful. No WIFI. Adequate cell service (AT&T). 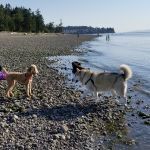 We camped at Birch Bay State Park in a Travel Trailer. Situated on Pearygin Lake, a very pretty site. Fairly level sites, close to each other. Full hookups or partial hook-ups. Swimming, fishing, boating, other water sports. Would have given the site 5 stars, if they weren't all packed together so closely. We camped at Silverline Resort in a Travel Trailer. Near Winthrop, Twisp, and Mazama. Good food, bike trails (road, and off road). A nice park. Lots of green grass and shade trees. Fairly level sites. The Sun Lakes / Dry Falls area is a geologically fascinating place to visit, and there are lot things to do. Swimming (we did, and loved it), boating, golf (we don't play). We camped at Sun Lakes-Dry Falls State Park in a Travel Trailer. DON'T go in August!!! It is REALLY HOT. Typically in the upper 90s. I'm guessing April or May would be good months to visit this park. Be sure to visit the Sun Lakes Dry Falls State Park Visitor Center... VERY interesting!!!!! Fish Creek is one of two campgrounds in Glacier National Park that can be reserved. It is on the west side of the park, St. Mary is the east side. The park is a fantastic place to visit, but I don't believe there are any campsites IN the part that have hookups of any kind. Another campground near Fish Creek is Apgar, which is quite large and swarming with people, a bit reminiscent of Camp Curry at Yosemite. We much preferred Fish Creek because it was quieter. If you like dry camping, this is one of the best campgrounds inside the park. The sites were extremely varied... some level, others very out of level, some with a large area for a picnic table, chairs, etc. others not so much. The access roads were reasonably good, but we saw someone with a longer trailer nearly destroy his awning trying to maneuver his trailer into a somewhat narrow pull-through. SPECIAL NOTE: While every loop (A, B, C, D) had clean well-maintained bathrooms, ALL of the showers are in loop A (4 total for 178 campsites). There is commonly a big lineup. While the shower stalls were clean, the dressing area outside the shower stall had a perpetually muddy floor, because it gets wet (naturally), and people are entering after having trekked a fair distance on dusty trails from other loops. We camped at Fish Creek Campground (NPS Campground) in a Travel Trailer. There are lots of things to do, hiking, Going to the Sun rd, boating, kayaking, swimming, fishing. We chose this park because it is about half way between other places we stayed at. It is situated along the Coeur d'Alene river, about 30 miles east of Coeur d'Alene, just off of I-90. It has scenic views of the river. There is a beautiful paved bike trail that runs through the park and follows the river for miles in both directions. The access is paved, the pads are concrete, and very level. Most, if not all, have electric and water, some have sewer. The owners are very friendly and helpful. The access to I-90 is convenient but the freeway noise is a downer... although this was no bother when we were sleeping. The bathrooms were clean and perfectly functional, but VERY homemade ("funky"), and might not pass code where we live. 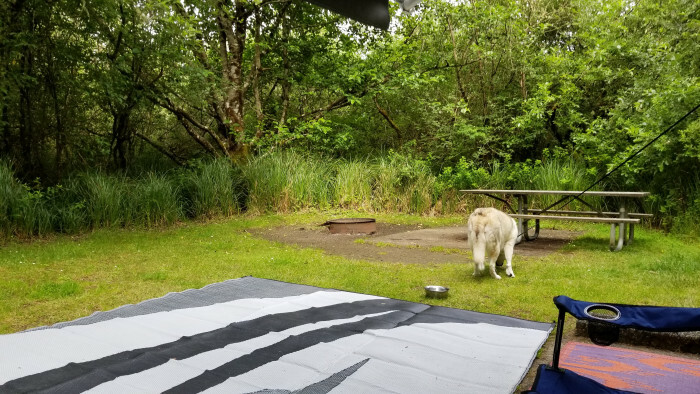 We camped at Kahnderosa River Campground in a Travel Trailer. Try the bike trails... We liked east better than west. Didn't disconnect because site was very level and only stayed one night. This park is a favorite. This was our first time there, and we will likely return again this year before the weather turns cold. 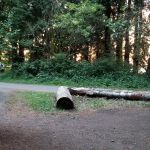 A huge green park, well maintained, many trees for shade, very level sites, lots of space between sites, fantastic paved bike trails following the Columbia river... a place to swim in the river. BTW - Didn't use the showers, but looked and they were clean... and we didn't bother unhooking the car because we were only staying one night and the site was dead on level. We camped at Wenatchee Confluence State Park in a Travel Trailer. Try the Apple Capital Bike Trail... If Wenatchee Confluence is full, try Lincoln Park, only 8 miles away, and connected by a paved bike trail. 3 miles down the beautiful Apple Capital Bike Trail (south) is the Pybus Market with places to eat, coffee, meat store, and lots more. Beautiful park, very scenic. Our site was very level. I think there was only one bathroom/shower building, we were conveniently located, but a good walk to the bathroom for some sites. Only gave 4 stars on service cuz we never saw anyone while we were there... Still everything was very tidy and well maintained. It rained (uncharacteristically) most of the time we were there, but I would normally expect heat. Not much shade, especially on our site. All the sites have a beautiful view of the lake (reservoir). The sites on the lower part of the loop are close to the water (I don't think the approved swimming areas are adjacent to the RV sites). I think the sites on the upper part of the look have a more expansive view (that's where we were, and we liked it). We camped at Emigrant Lake - The Point RV Park in a Travel Trailer. This is a delightful park. Sites are all very level, paved with good separation. Nice Bike trails. Didn't disconnect because the site was perfectly level and we only stayed 1 night each way. This park was exceptionally quiet... at least when we were there. 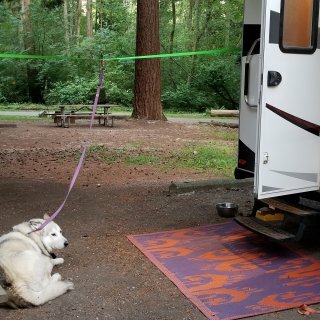 We camped at Champoeg State Heritage Area in a Travel Trailer. This is a beautiful park! 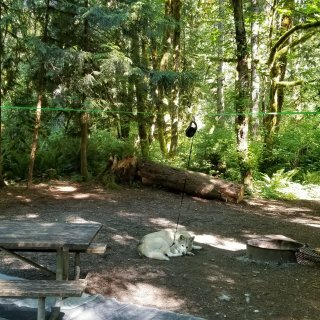 About 2/3 dry camping sites, some with very nice views, and 1/3 electrical/water in forested setting... huge Douglas firs and cedars. We stayed in the forest area with water and electric. Site levelness is variable, but many sites are nearly perfectly level. We stayed in site 41, which was very level, no side to side leveling required (we will try to get this site again). The State Park website described the privacy of this site as poor, which I found odd as it is certainly one of the most private sites in the park, and one of the most private sites I have ever seen. Lots of nice trails for hiking with fabulous scenery. The only downside to this park is that it is near the Whidbey Island Naval Air Station. The planes at this base include fighter jets and prop planes, both types of which fly practice runs very close to the park... it can be very loud. This is the reason I didn't give an overall rating of 10. Even so, we still enjoyed our stay very much, and will likely stay here again. 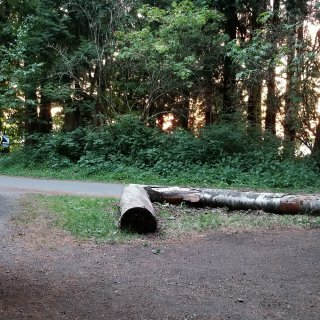 We camped at Deception Pass State Park in a Travel Trailer. 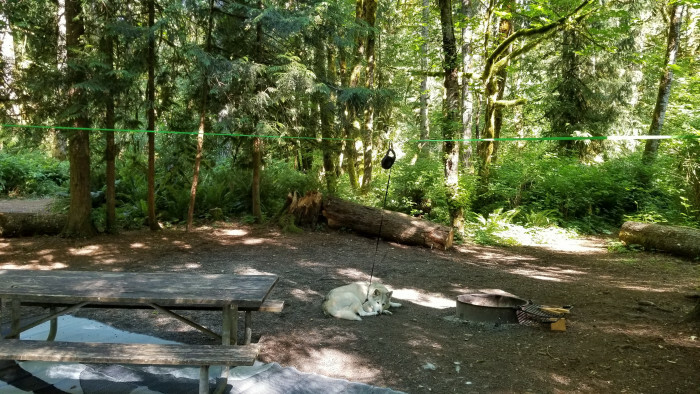 This park is one of our favorite WA State Parks. Full hookups, widely spaced sites, some sites have terrific privacy, and amazing shelter from the wind. We camped at Fort Worden State Park (Beach campground) in a Travel Trailer. Get a site on the big loop adjacent to the wooded area... Great privacy, excellent wind shelter. This park is in a spectacularly beautiful location. We did not have to pay any fee (I said $1 cuz it wouldn't accept $0) to stay because we were participating in a beach cleanup (but I think it is usually pretty inexpensive). Our site (D38) was kinda small but we made it work (it was first come first serve, and some of the best spots were taken by tent campers... they do take reservations later in the year). If you are looking for privacy with an amazing view, try to get D24. 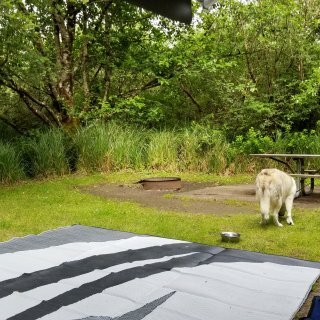 We camped at Kalaloch Campground (NPS Campground) in a Travel Trailer. Go when you can get a reservation... Try to get a site overlooking the ocean. This is a wonderful RV park. Apparently, the new owners took it over a year or two ago. It is clear they have done much to improve every aspect of the facility. We arrived just after 8pm... one of the owners came running out as we drove up and guided us right into our space. When we made our reservation, we had mentioned that we were only staying one night, arriving late, and leaving early... so we were hoping to get a space that didn't require leveling. The space they gave us was absolutely dead on level side to side and front to back... we didn't even have to unhitch the car. My wife asked if they sold firewood... A few minutes later the owner delivered fire wood and started the fire for us. The owners are some of the friendliest and most helpful people I have ever met. The bathrooms were amazing... spacious and spotlessly clean... they looked new. There are a big variety of spaces in this park... pull through, back-in, places for big rigs, shaded, wide open. We camped at Elwha Dam RV Park in a Travel Trailer. This site is close to the Elwha river on the north side of the Olympic peninsula. Lots of of great hiking in this area. Also, close to Port Angeles. Nice, most spaces have good privacy. Needed to do some leveling... Plenty of room for awning & slide. Very friendly staff. Spaces 3 & 4 provide GREAT views (less privacy). Biggest issue for us was ground water... Late summer probably not a problem... March/April soggy ground everywhere (not in campsites). Great beach for clamming/bird watching. 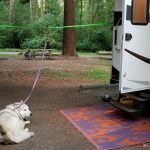 We camped at Bay View State Park in a Travel Trailer. Town of Edison (quaint), 6.5 miles... Great food, fabulous bakery, easy bike roads to/from Campground, 20 minute drive to Anacortes with many good restaurants, grocery, etc.